The next event for the “Daytimers” will be the annual movie and ice cream social, Wednesday, July 20, at 1 p.m. The featured film is Woody Allen’s “Vicky Christina Barcelona.” Two girlfriends on a summer holiday in Barcelona become enamored with the same painter, unaware that his ex-wife, with whom he has a tempestuous relationship, is about to re-enter the picture. Vicky (Rebecca Hall) is a grad student in Catalan studies, engaged to a safe man; Cristina (Scarlett Johansson) is finding herself, knowing that safety is not what she wants. Juan Antonio (Javier Bardem), an artist rumored to have a violent marriage behind him, invites them to spend a weekend with him. They accept. As the summer goes on, their time with Juan Antonio challenges Vicky’s assumptions about who she is and suggests to Christina that she may have found herself. Into the mix come Juan Antonio’s volatile ex-wife and Vicky’s reliable fiancé. In the end, it is a confrontation with the ex-wife, Maria Elena (Penelope Cruz) that convinces Vicky what she really wants in life. The other film is a 14 minute short film, “Second Watch.” Berkowitz, an Israeli Reserve soldier, is on watch in a remote post along the Jordanian border. Just a few yards away, across the border, he finds an equally bored Jordanian soldier. Expect a comic exercise watching the interaction between the two guards. There are already orders for lactose-free, and sugar-free ice cream. For those who need a special kind of ice cream, specify that when you make your reservation. Movie and ice cream are $5 (such a deal)! For reservations, call Barbara Rubin at 817-927-2736, or checks can be mailed to Daytimers, Beth-El Congregation, 4900 Briarhaven Rd., Fort Worth, TX 76109, or you may reserve on line at http://www.bethelfw.org/donations. 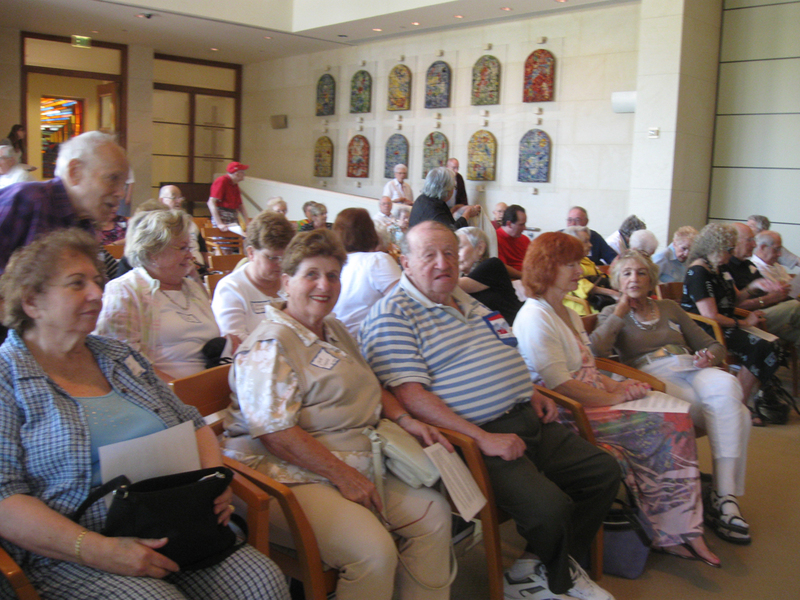 The Sylvia Wolens “Daytimers” is a program of Beth-El Congregation with financial support from the Jewish Federation of Forth Worth and Tarrant County. The Israel Scout Friendship Caravan will hold a concert at Ahavath Sholom on Wed., July 6 at 7 p.m. The program is open to the community and a $5 voluntary donation will be accepted. The event is partially sponsored by the Jewish Federation of Fort Worth and Tarrant County. The Friends of Israel Scouts, Inc. Tzofim is a non-political scouting program that sends Israeli teens to America. These teens are sent to camps across the United States, where they serve as counselors, interact and perform for Jewish kids and audition for the Friendship Caravan. The Caravan tours from city to city, performing and celebrating Israeli traditions. These teenage ambassadors of Israel teach audiences about their culture. The audition process is extremely competitive, and only 40 are selected to be members of the Caravan. They are chosen for their outgoing personalities and fun spirits, and must be fluent in English, enjoy interacting with people and understand Jewish history and culture. North America is divided into four different regions, and the 40 young people into four different groups, each focusing on one region. The four groups each explore their region, traveling to a variety of places and experiencing American life. They stay for at least two days in each city, but longer in larger cities like Dallas, where there are multiple performances. The west region, which includes North Texas, is called Caravan Degania. There are two leaders in the group, one male and one female, between the ages of 23 and 24. They already have experience as scout leaders, and have auditioned and trained to be a Caravan leaders. The 12-person group lives on a bus as they travel between cities, with a trailer attached. Leaders and teens will stay with host families for the nine nights they are in Dallas. The host families must have at least one child between ages 10 and 18 at home during this period. It is important that the Israeli teen and the host family child are close in age and of the same gender so they can comfortably interact. 2-3 inch zipper binders in red, yellow, green, blue and black (these are the most expensive item so there is a real need for these binders. Giving these would be a huge mitzvah! ); 1” – 3” binder; dividers with tabs; 3 subject spiral notebooks ; 12” pocket folders with brads (red and green); wide ruled notebook paper; ¼” graph paper; composition books; 3” x 5” index cards; zipper pouch supply bags; standard metric ruler; protractor (clear, flat plastic); adult Fiskers scissors; glue sticks; pink erasers; thin tip black Sharpies; Crayola Classic Broad Tip Markers; Crayola Classic Thin Tip Markers; Crayola Colored Pencils; #2 pencils; blue, black, red ballpoint pens; yellow highlighters; AAA batteries; paper towels; tissues; quart or gallon sized Ziploc bags and backpacks. Please bring the supplies to CBI and place them in the Mitzvah Closet. Thank you for your generosity. The schools are excited and grateful that this is taking place. Please feel free to call with any questions. For more information contact, Robin BenBassett at 817-251-0508 or Laura Cohen at 817-812-3070. Mazel tov to Matt Nover, son of Maureen Nover and Mark Nover, and grandson of Shirley and Earl Givant, who graduated from Rutgers University May 15 with degrees in Judiac Studies and Physics. Matt has been accepted with a scholarship to the Jewish Theological Seiminary in New York, where he will continue his studies. I read your article on reincarnation and it was really interesting, and raised a couple questions: Does reincarnation explain why it is believed that we were all at Mt. Sinai to receive the Torah? Secondly, how do you explain dreams…for example, Holocaust dreams? Is it a window to a previous life or just your imagination? Or when people who have died visit in your dreams? Is that just your imagination or something more; does that mean their soul is not back on earth? This is enough for a few columns, but I’ll try to answer you concisely. Technically, reincarnation, as the word implies, is the return of the soul to a second corporeal body after it has already occupied its first one. It does not apply to the first-time entry of a soul into a body. The sages teach that all Jewish souls were present at Sinai to participate in the acceptance of the Torah by the entire Jewish people for all time. In this way, all Jewish souls endowed into Jewish bodies throughout history are included in the national and individual responsibility of upholding and fulfilling of the Torah. 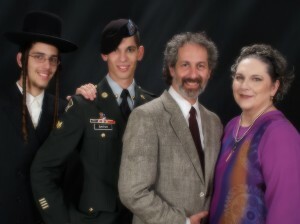 Since most of those souls at the time had never been contained within a physical body, you could not evoke the concept of “reincarnation.” The lessons inculcated into the soul at Sinai were done so as a soul alone, as of yet lacking the usual partnership between body and soul, which is normally encompassed by Torah study and fulfillment of mitzvot. You do, however, see from that event the ability of the eternal soul to receive messages and missions and take those with it when joining a body; this is the foundation of the concept of reincarnation. The notion of dreams is a multi-faceted one in Judaism. The Talmud and kabbalistic writings refer to numerous categories of dreams. Some dreams, particularly for those on a very high spiritual level, can be a type of divine inspiration revealing a nearly prophetic type of message or intuition into the future. There have been rabbis, rebbetzins and other spiritual Jews who have received profound insight into concepts of Torah through dreams, some even on a steady basis. This is predicated upon the understanding of sleep; the partial detachment of the soul from the body to refresh itself in the higher, heavenly realms to have a “recharge”; to give it the strength to traverse yet another day in the physical world. While “up there,” the soul could receive heavenly insights not available in its normal, corporeal state. There have been many situations where vivid, intricate details were revealed to a child or adult about a person no longer alive in a series of dreams which could have only been known by the person they dreamt about. This certainly alludes to a reincarnation, and has been the stuff of much research by psychologists and others and is available to read. Alas, the sages explain that most of our dreams are the product of our thoughts during the day, things we have read, and our unshackled imaginations running wild and unhindered with the freedom of unconsciousness and sleep. Pleasant dreams! Larry and Sara Baitch are thrilled to report that after 14 months, their son, Colten, returned stateside on June 22 from Afghanistan with the rest of the 1-66 Iron Raiders Brigade. “We are all very grateful to Hashem for his safety and thank all our friends in Dallas for their thoughts, prayers, tehillim and support,” wrote Larry in an e-mail to the TJP. Colten was promoted to Sergeant on his birthday. He came home with a number of commendations and medals for his performance in battle, but he also carries the memories of his comrades who were wounded and killed in action. Colten is a member of the HHC 1-66 attached to the 4th Infantry Division, based in Ft. Carson, Colo. Colten is also the brother of Asa, 22, an Aleksander Chasid, who is a history major in his senior year at the University of Maryland in College Park. The Leo Baeck College in London, the leading European institution for training Progressive rabbis, has appointed the first woman principal in its 55-year history. Rabbi Deborah Kahn-Harris, 42, will take over from Rabbi Professor Marc Saperstein, who will retire this autumn after five years at the helm. Deborah is married to Dr. Keith Kahn-Harris and they have two children, Kobi and Ella. Deborah grew up in Houston and Dallas and did her undergraduate college studies in the States. Her graduate school at Oxford in Hebrew studies led to her seek admission at Leo Baeck where she studied, graduated, and was ordained. She has actively been a part of the London/British community as a college chaplain, director of Student and Young Adult Work, serving on the rabbinic team at Sha’arei Tsedek North London Reform, teaching at Leo Baeck College, and researching Bible at the University of Sheffield. Kahn-Harris said she was “humbled and thrilled” to lead the college. “It’s an interesting and exciting place with a huge amount of potential,” she said. After her rabbinic ordination, she served as a Reform university chaplain and director of young adult work before spending time in Jerusalem and Australia. Her appointment marks a departure for the college not only because she is a woman but she also has congregational experience: Professor Saperstein and his predecessor, Rabbi Professor Jonathan Magonet, were primarily scholars. Rabbi Kahn-Harris said that one of her goals would be to bring the academic and vocational aspects of Leo Baeck “closer together.” While one of her tasks will be to implement a review of Leo Baeck’s activities, she said its core work would remain in training. Rabbi Kahn-Harris’s son Kobi and daughter Ella attend Akiva school. Her husband, Dr. Keith Kahn-Harris, is the coauthor of Turbulent Times, a study of modern British Jewry published last year. Deborah is the daughter of Dr. Herb and Joy Weinstein of Dallas. The Friends of Israel Defense Forces (FIDF) held a parlor meeting on June 18. Dr. Rami Sagi, a Lt. Colonel with the IDF, came to Dallas to tell his story of the IDF’s medical rescue efforts in Haiti. The meeting was attended by over 30 members of the Dallas community. It introduced the Friends of the IDF organization. The Dallas community has pledged to “Adopt a Battalion” in Israel, providing funds for patch ceremonies, Jewish holidays, and creature comforts to the soldiers of a UAV Squadron of over 500 soldiers. Dr. Sagi spoke of the heroism of the IDF soldiers and the humanitarian efforts all over the world and his personal experiences. For more information on the FIDF, please contact Beth Berk at 214-350-5373 or Lisa Hacker, development logistics director of the FIDF, at 312-372-8500. Naomi Nason, daughter of Meryl and Scott Nason, has set up housekeeping on Mount Scopus this summer while attending the Hebrew University of Jerusalem. Naomi, a former TJP intern and graduate of Levine Academy and Hockaday will be a junior next year at Northwestern University’s Medill School of Journalism. Following Israel, Naomi will be off to Beijing, China where she will spend a semester abroad. You can follow Naomi’s Israel adventure at her blog: http://the195.com/northwestern/author/nnason/. Meryl and Scott Nason have more to celebrate as well with son Josh’s recent accolades. Josh has been named as a Wexner Graduate Fellow/Davidson Scholar and will be attending Johns Hopkins University School of Advanced International Studies (SAIS) beginning in January 2012, where he will be pursuing a Masters Degree in Middle East Studies. Josh graduated from Cornell University in 2008, and has been working for the Zionist Organization of America for the past three years. Josh is currently the managing director for Campus Programs at the Zionist Organization of America. Following the completion of his Master’s Degree, Josh hopes to continue working in Israel Advocacy and strengthening United States-Israel Relations. The fellowship, sponsored by the Wexner Foundation, selects an elite cohort of future Jewish professional leaders each year. Within each class of Fellows, the Wexner Foundation selects a diverse group representing different denominations, different political perspectives, and different sectors of Jewish professional work including Rabbinical students, Cantorial students, Jewish educators, and more. The fellowship will provide a stipend for two years, and all Fellows attend Fellowship retreats each summer and winter for four years. With the Fourth of July just days away and more people heading out on road trips, longtime subscriber Bernie Dworkin is reminding you to buckle up. Bernie contacted the TJP this week with the following message: “How important is the car seatbelt? I found it unhandy when trying to retrieve something from my pocket. Honestly, there were times when I drove without it. Of course, I shouldn’t have been doing anything that would divert my attention from the road. “I was in route to the VA Medical Center and collided with another car. My car was totaled and subsequently went up in flames. The windshield was lying in front of the car in a multitude of pieces. Had I not been wearing my seatbelt I would have been lying on the freeway with the windshield. I was saved by the seatbelt. Mazel tov to Jordan Cope, Levine Academy graduate and incoming sophomore at Yavneh Academy. Jordan joins Yavneh’s Celebration of Success winners for the 2010-2011 year. Cope, who founded the school’s World Quest chapter of the World Affair Council earned top grades throughout the year, Jordan was the 11th place finalist several years in a row at the State Level National Geographic Bee and intends to take the school to a higher level this year at the World Quest Competition. The Israel Scout Friendship Caravan will roll into Dallas July 3 and meet their host families. The Friendship Caravan consists of 5 male and 5 female Tzofim (Israel Scouts) who are entering their senior year of high school. The Caravan travels thoughout North America each summer as emissaries, sharing their lives in Israel through song, dance and story. Participants are chosen after undergoing an extensive auditioning and interviewing process, ensuring that above all, they are true representatives of Israeli culture and spirit. This year’s community performance will be held at the Aaron Family JCC at 7 p.m. Thursday, July 7. Although there is no charge for the performance, a $5 voluntary contribution is allowed. “You can teach your children that a good decent, ethical person has a big, loving heart when they feel you feeling another’s pain, when they know that you are committed to alleviating human suffering. “You can teach your children that a good, decent, ethical person has big, open hands when they watch you give of your resources — generously and often — and when they watch you give of the work of your hands — willingly and joyfully. What does it mean to be kind to a friend? What does it mean to be kind to an animal? Think of a time when someone hurt you. How did it feel? Try to “put yourself in someone’s shoes.” What does that mean? How does it help us to understand others? Shabbat Discussion: Tell about Rabbi Tanchum of whom it is said, “When he needed only one portion of meat for himself, he would buy two; one bunch of vegetables, he would buy two — one for himself and one for the poor.” How could you do this in your family? Make a promise to think of others when grocery shopping — buy a second portion of something for the food bank. A king wished to build the most splendid palace imaginable. After years of construction, it was finally ready to be painted. Two artists were hired to make the palace look like no other in the world. The first artist was asked to decorate one side of each hallway, the second to adorn the facing walls. The first artist searched the world for beautiful colors and designs, and spent five years painting wonderful images of animals and landscapes. The second artist spent most of his time doodling and daydreaming. Finally the first artist was almost finished. The lazy artist began to worry, then to panic. With only a short time left to work, how could he equal the splendid pictures of his colleague? He covered his walls with mirrors. With Independence Day just a few days away, it seems only fitting to offer up a quick and easy menu that will give you plenty of time to enjoy the fireworks. Well, easy for sure, somewhat quick and maybe just a bit more complicated than the average fare. But, you CAN cook ahead and still have fresh and delicious dishes. Sure, cooking tube steaks (hot dogs) are fast and shaping raw ground beef into hamburger patties is simple (even when I combine 2/3 c. Italian salad dressing and 1/3 c. soy sauce and brush this over the burgers as they cook). But with a little more effort, you can serve Lime and Chili Marinated Barbecued Chicken — delicious made ahead of time and served just warmed (put the chicken in a pan and keep warm on the warm (not hot) grill, after cooking. A chopped salad, with no lettuce, is another way to make ahead — try the Israeli salad to the right bursting with fresh tomatoes, bell peppers and cucumbers. And corn on the cob, grilled ahead of time, is fabulous served at room temperature (and decorated with your choice of great seasonings). Go forth on the fourth — and serve a tempting make-ahead menu. Use these recipes to add to your repertoire or save them for another occasion. Just remember, it’s always good to be independent from big work while you celebrate. For simpler fare, use this marinade for about 2 to 3 lb. of boneless and skinless chicken breasts and grill them for 4 to 6 minutes over high heat. Place chicken in a zipper-style plastic bag (you may need 2 bags). Combine all marinade ingredients in a medium bowl and whisk well. Pour this over the chicken, seal the bag and turn several times to coat. Chill up to overnight (no more than 10 hours). Thirty minutes before cooking, remove the chicken from the refrigerator. Heat grill to medium. Place the chicken on the grill. Keep the marinade chilled. Close the hood or lid of the grill and cook for 20 minutes (check to ensure that the chicken is not charring too quickly). Brush the marinade over the top of the uncooked chicken and cook for 20 minutes more (breast meat will take less time — be prepared to remove the breasts from the grill after about 30 minutes of cooking). Discard marinade. Season with a bit of salt and pepper before serving hot or at room temperature. Makes 6 servings. Combine all ingredients in a large bowl and toss well. Adjust lemon juice and seasoning to taste. Makes 8-12 servings. Chili powder, lime or lemon wedges, dried dill, extra-virgin olive oil mixed with minced garlic, assortment of hot pepper sauces (served from the bottles), Montreal Steak Seasoning or Lawry’s Seasoning Salt or granulated garlic. Rub corn with a small amount of oil. Heat grill to medium-high. Place the corn on the grill and cook on all sides, until lightly charred. Serve hot or at room temperature with salt and pepper on the side, as well as an assortment of seasonings (examples are listed above) to dress us the corn to serve. Combine all ingredients in a large bowl and, using a rubber spatula, fold well to combine. Spray a glass or ceramic baking dish or casserole with nonstick cooking spray. Transfer the beans to the dish, cover with foil and bake for 1 hour. Remove cover and cook for 30 minutes more. Serve hot. Makes 8 (or more) servings. Denser than a cake, but not a brownie, these easy to cut and fun to eat squares are simple to prepare. Preheat oven to 350°F. Line bottom and sides of a 9 x 13 inch pan with parchment. Microwave chocolate and butter in a large microwave-safe bowl at high for 2 minutes or until melted and smooth, stirring at 30 second intervals. Stir in sugar. Add eggs, one at a time, whisking just until blended after each addition. Gently stir in flour and the next four ingredients. Pour mixture into prepared pan. Bake for 35-40 minutes or until a wooden pick inserted in center comes out with a few moist crumbs. Responsibility, “Achrayut,” is so important because it is really all about community and being a part of something bigger than just oneself. We are all interdependent in this world and that connection makes us stronger. Shortly after World War II — not long after his release from a Nazi concentration camp — German Protestant theologian Pastor Martin Niemoller said, “In Germany, they first came for the communists, and I didn’t speak up because I wasn’t a communist. Then they came for the Jews, and I didn’t speak up because I wasn’t a Jew. Then they came for the trade unionists, and I didn’t speak up because I wasn’t a trade unionist. Then they came for the Catholics, and I didn’t speak up because I wasn’t a Catholic. Then they came for me. And by that time, there was no one left to speak up.” Each of us must speak out for the others — we are responsible for one another: Am I my brother’s keeper? YES! Achrayut is also about being able to take responsibility for your own actions and choices. Responsibility is about keeping our promises, being honest and fair, admitting our mistakes and showing our willingness to make things right. What does it mean to be responsible? What things are you responsible for at home, with your friends at school or at camp? When you are on a team, you are responsible to that team. What happens if you cannot go to a game? Should you choose to go to a party instead of the game? If God is the owner of the earth, what is our role? King Solomon was known as the wise king, but the Queen of Sheba was not one to believe all she had heard. Arriving in Jerusalem with a magnificent caravan and many precious gifts, she decided to test Solomon’s wisdom with some riddles. King Solomon guessed all the answers and made a very good impression. Can you do as well? We have had much debate in class at religious school if we, as Jews, believe in reincarnation. Many kids felt this is a belief of people from India and places around there, but Jews don’t believe in these kinds of things. Could you please tell us if there are any Jewish sources for or against reincarnation? Reincarnation, also known in English as “transmigration of the soul,” is not considered an essential tenet of Jewish belief as it is not mentioned explicitly in the Torah or Prophets, and not codified in Maimonides’s 13 core principals of Jewish faith. Early medieval Jewish scholars discussed and argued this concept, some for it and others against it. This belief, however, is overwhelmingly accepted as a Jewish belief by most Jewish philosophers and experts in rabbinical sources over the last 500 years, and is the theme which fills hundreds of Chassidic stories. The source of this belief is the “Book of the Zohar,” the principal source of kabbalistic thought, which openly discusses the concept of reincarnation; in Hebrew known as gilgul neshamos. There is also the classical work of R’ Chaim Vital “Sefer Hagilgulim” or “Book of Reincarnation,” based upon the teachings of his rabbi, the famed kabbalist R’ Yitzchak Luria of Safed, known as the Ari’z’l, in which he compiled an extensive list of those reincarnated in Jewish history. Both the Baal Shem Tov, founder of Chassidism, and Rabbi Eliahu of Vilna, originator of the Lithuanian Yeshiva movement, are strong proponents of this belief as propounded in the Zohar and by the Ar’iz’l. This concept is the source of the Yom Kippur liturgy which recants the murder of the 10 leading Jewish scholars who were said to be incarnations of Joseph’s 10 brothers who sold him to slavery; their deaths atoning for that sin so long before. Both the kabbalists and Maimonides refer to hints in the written Torah and prophets to the occurrence of reincarnation. The purpose of reincarnation is not viewed as a punishment or retribution or even fatalistic. It is, rather, an expression of Divine compassion. The word gilgul means to revolve or spin. The “spin” of the neshamah, soul, is a gift of love from the Al-mighty. It is based upon the core Jewish precept of cosmic rectification, or tikkun. Every soul is sent to this world to partner with a physical body in order to carry out a unique mission. The trials and tribulations one endures throughout life are the tests and opportunities for one to fulfill their mission, the distinctive tikkun they are meant to accomplish in the world, and in turn, as a tikkun to that soul itself. Most of us fall short of our missions and are given a second (and, sometimes, a third) chance for our souls to achieve our tikkun. This is gilgul neshamah, the spin of the soul back down to this world after returning above. This idea also adds meaning to many tragedies we witness around us. There are certain souls, which, at times, were very close to achieving perfection and need only a very short gigul/tikkun in this world. This is one explanation why some babies or children have died very young. It also explains, at times, why certain people are born without basic mental faculties, Downs-syndrome and others; those individuals are said to have the highest, holiest, most perfected souls who don’t need their own testing. Their lives are a test for others to perform chesed, loving kindness, to them, that provided whatever small tikkun they still need for their own souls. The venerable sage the Chazon Ish was known to stand up for a mentally challenged child like he would stand in the presence of a great sage, saying he is in the presence of a very elevated, holy soul. Jewish roots in basketball and the Mavericks’ championship season were the topic at last week’s Mamaloshen Morning program. The Yiddish program meets on the second Thursday of the month at 10:30 a.m. Shown (from left to right) are seated, Sadie Davidoff and Eve Karlebach, Ruthie Rosen; middle row (l to r) Maggie Furst and Dorthy Abrams; back row (l to r) Mona Allen, Gordon Cizon, Michael Lev, Larraine Miller and Roberta and Steve Toback. 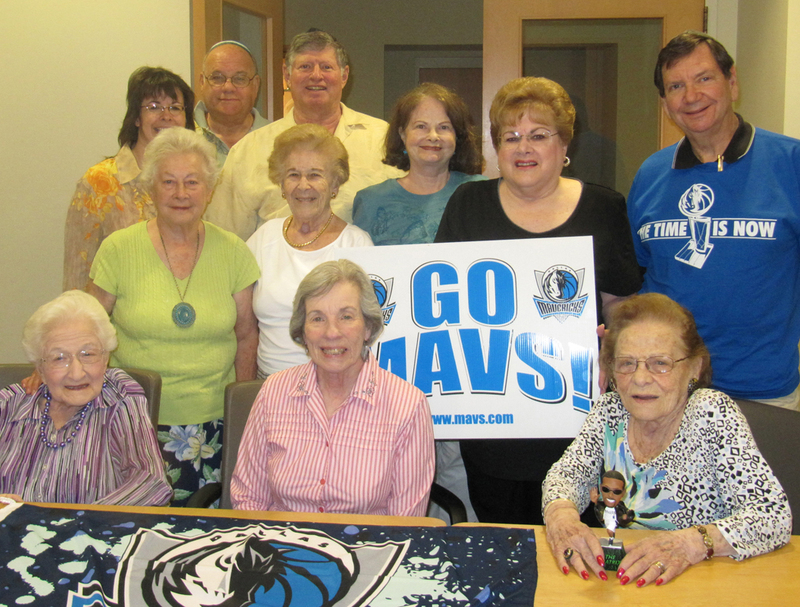 Instead of joining the hundreds of thousands that lined the streets of downtown Dallas to celebrate the Mavericks historic championship season, a group of Yiddish enthusiasts celebrated the victory at the Mamaloshen Morning program at Congregation Shearith Israel. The program is a monthly Yiddish class that meets the second Thursday of every month; the only qualification is a readiness to laugh. However, last Thursday, Mona Allen put emphasis on the Jewish relevance to the sport of basketball, reading aloud bits and pieces of articles she had found. Allen began by reminding the group that basketball has, for the most part, been a game of the inner city. At the turn of the century, European Jews came to the ghettos of prosperous Eastern metropolises, with New York and Philadelphia being at the center. Basketball had a rough reputation, with rules providing for few fouls making the game at times hard to control. On the rare occasions where the basket had a backboard, it was only to keep spectators from interfering. Quickly, the Jews began to impose a different style of play by becoming better passers and runners instead of succumbing to the fighting tactics the game had seen before. However, with the emergence of the National Socialist Party in Germany and the escalation of anti-Semitism in the United States, the Jewish players faced racial slurs and biased officials. After World War II, the Jews no longer dominated the sport. Instead, urban basketball courts had been passed to African Americans, while Jews moved on to other pursuits. Allen also taught about Abraham Saperstein, a member of the Basketball Hall of Fame and the International Jewish Sports Hall of Fame. Saperstein was the creator, owner and coach of the Harlem Globetrotters, a team that added horseplay into their games after winning became all too easy. Nevertheless, Allen saw some direct comparisons between the earlier Jewish players and the Mavericks. Besides the passing game that both groups developed, she mentioned the concentration of the underdog. Although insistent she wasn’t a sports fan, Nancy Friedman had sports run in the family, with her late father-in-law, Jack Greenberg, being a hall-of-fame referee before the outbreak of World War II. Friedman told the group about the $5 he was paid to call the games and the way society looked down upon his career at the start of the war. Cizon and the rest of the seniors felt a sense of closeness to Friedman as she told the story, regardless of whether or not they personally liked sports; they recognized the significant impact their heritage had on the evolution of basketball. On March 3, 1934, a group of young Jewish men helped change basketball history. On that night, fans in New York City watched with anticipation for the winner of a game between New York University (NYU) and City College of New York (CCNY). The “New York Times” stated that the 20th annual meeting between the two schools had “never before … aroused such widespread interest,” as both teams entered the contest undefeated. The demand for tickets was such that promoters began a series of doubleheaders at Madison Square Garden the following season and turned New York City into the center of the basketball world. Both the NYU-CCNY game, in which nine of the 10 starters were Jewish, and the “Newsweek” article occurred during the peak of Jewish prominence in basketball. Yet, the story of Jewish basketball is more than either a single game or article. Centered in New York, Jews were crucial to the development of college and professional basketball during the first half of the 20th century. Invented by Dr. James Naismith at a Young Men’s Christian Association (YMCA) in 1891, basketball quickly became a popular sport that expanded into the broader society. As industrialization, immigration, and urbanization drastically transformed America at the turn of the 20th century, many Americans saw basketball as an ideal sport since it taught teamwork, cooperation, discipline, and obedience. During the Progressive era, the popularization of basketball among Jewish youth in urban areas primarily occurred both in settlement houses and at communal institutions. Jewish youth on New York’s Lower East Side played basketball on playgrounds and at schoolyards. The formation of the Public School Athletic League (PSAL) in the early 1900s allowed players to gain experience in organized, competitive settings. By the middle of the decade, CCNY established a basketball team full of local Jewish men. Players such as Barney Sedran, Ira Streusand, and Harry Brill honed their skills at City College and upon graduating, began to play in the various professional leagues in eastern cities. At the time, the definitions of “amateur” and “professional” constantly changed. Even college basketball, which had roughly 200 teams by 1910, remained relatively disorganized and was certainly not a national sport in the same sense as college football. These chaotic conditions allowed Jewish players to find a niche in the game, as neither college nor professional teams seemed interested in restricting Jews from participating. Much of American society viewed professional basketball as a dirty and rough sport. Professionals played in cages made of rope or chicken wire in order to protect the players from unruly fans and to keep the ball in continuous play. There were no standards for the size of the court or the size of the ball, and contracts were nonexistent. Players jumped from team to team for better pay, sometimes even between games. Jewish players led teams that won championships in numerous East Coast leagues. Yet the players themselves were relatively anonymous. But after World War I, basketball became more stable, starring a new generation of Jewish players. In the early 1920s, Jewish basketball spread throughout the country. As neighborhoods stabilized due to immigration restriction, American-born children began to assimilate and embraced America’s sporting culture. Jewish players often played at YMHAs, synagogues, and community centers before and after their college or professional careers. But Jews were not always welcome in athletics outside of their own leagues. The decade also saw anti-Jewish attacks intensify. When Harvard University’s president openly declared the need for quotas because Jewish students did not “fit in,” he was in part referring to the university’s athletic culture. In the midst of the controversy, as other schools such as Columbia, Yale, and Syracuse considered quotas, Yale University alumni demanded their coaches end discriminatory practices against Jewish basketball players in order to field a winning team. “The American Hebrew newspaper wrote that Yale’s recognition of Jewish players proved that sports could help Jews receive acceptance on campus and facilitate integration. Jewish prominence in basketball also helped the game itself spread. Nat Holman, who coached at CCNY, also played professionally for the Original Celtics, a former settlement house team that had Jewish, German, and Irish players. Holman and the Celtics have been credited for popularizing basketball throughout the country in the 1920s. During their long barnstorming trips to play teams in the South and the Midwest, the Celtics wowed local audiences with their strategies, skills, and showmanship. They played more than 100 games per year and often lost fewer than ten. The popularity of the Celtics convinced promoters of basketball’s commercial appeal and led to the development of a national league called the American Basketball League (ABL) in 1925. Holman and other Jews played in the league until it folded due to financial problems caused by the Depression. In the 1930s, Jewish entrepreneurs established independent teams such as the New York Hakoahs (From the Hebrew word for strength) and the Philadelphia Sphas (an acronym for the South Philadelphia Hebrew Association). Jewish players were prominent in a new ABL that formed in the early 1930s, but the professional game remained limited as a semi-professional and regional sport. Teams played in urban neighborhoods in the Northeast and players often both lived and worked close to their fans. While professional basketball remained a marginal sport during the Depression, college basketball became one of the most popular sports in the country. At Madison Square Garden, Jewish players filled the rosters of New York schools such as NYU, CCNY, Long Island University, and St. John’s University that hosted teams from around the country. The mainstream press began to focus on a specific playing style of New York schools based on constant motion, quick passing, and deliberate cuts to the basket. Both Jewish and non-Jewish commentators connected this style to the mental acuity and lack of size of Jews. This style challenged Western teams who played with the more open, fast-breaking style. The doubleheaders became testing grounds for regional supremacy. From the late 1930s to the early 1950s, the Garden also hosted the National Invitational Tournament (NIT) and the NCAA Tournament. Teams with prominent Jewish players won five of the first seven NITs. In 1950, Holman’s CCNY team, with primarily Jewish players, won both tournaments. Called the “Grand Slam,” the accomplishment was never repeated. Along with schools such as Kentucky and NYU, however, the CCNY team was embroiled in a point shaving scandal in the early 1950s. Players accepted money from gamblers to either lose games on purpose or win by less than the point spread. The scandal almost destroyed college basketball and led to the demise of New York college basketball, which diminished a centralized Jewish playing presence in the sport. The scandal was not the only reason for Jewish basketball’s downfall. A formal league called the Basketball Association of America (BAA) had been established in 1946, and was renamed the National Basketball Association (NBA) in 1950. Jewish players at the time typically had other jobs during the season and were accustomed to playing semi-professionally. Few remained in the league, as basketball could not support their families. Socio-economic success also contributed to the decline of Jews in basketball. Moving to the suburbs created more opportunities to succeed in mainstream society. Sports became less important and though Jews continued to play basketball, they did so in a different environment than the urban street culture of the heyday of Jewish basketball. There were still a few Jewish players who made it to the top of the game such as Lennie Rosenbluth and Art Heyman in the 1950s and 1960s. But since the early 1970s, Jews have been primarily coaches, general managers, and owners in college and professional basketball. Among the most prominent are Hall of Fame coach Larry Brown, NBA Commissioner David Stern, Dallas Mavericks owner Mark Cuban, and Washington Wizards general manager and former player Ernie Grunfeld. The rise of Jewish basketball reflected American Jews’ larger story during the first half of the 20th century. From immigrant neighborhoods, Jews sought out opportunities to join the mainstream. Success in basketball is just one story of achievement during a time of adjustment, stress, and occasional anti-Semitism. At the same time, Jews made a lasting contribution to the game. While few Jews played at the highest levels, the sport owes its development to its roots with the Jewish neighborhoods teams. Reprinted with permission from myjewishlearning.com. Ari Sclar is a PhD candidate in history at Stony Brook University and an adjunct lecturer at Hunter College. His doctoral dissertation examines basketball’s impact on American Jewish culture and identity in the first half of the 20th Century. He previously directed content for the Jews in Sports web site, first at NYU and then the American Jewish Historical Society. An overflow crowd joined Mark Kreditor in a sing along. Kreditor does all his musical programs to raise funds for the Ann and Nate Levine Academy and the group donated nearly $300 for the program. The next event for the “Daytimers” will be their annual movie and ice cream social, Wednesday, July 20, at 1 p.m.
For reservations, call Barbara Rubin at 817-927-2736. 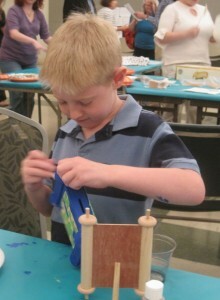 Checks can be mailed to “Daytimers,” Beth-El Congregation, 4900 Briarhaven Rd., Fort Worth, TX 76109, or you may reserve your spot online at http://www.bethelfw.org/donations. 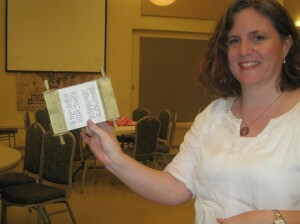 Angie Kitzman displays her Torah at the Beth El Shavuot celebration. Ilana Knust tells the TJP that Beth-El Congregation has had some stellar programming while celebrating Lag B’Omer and Shavuot. 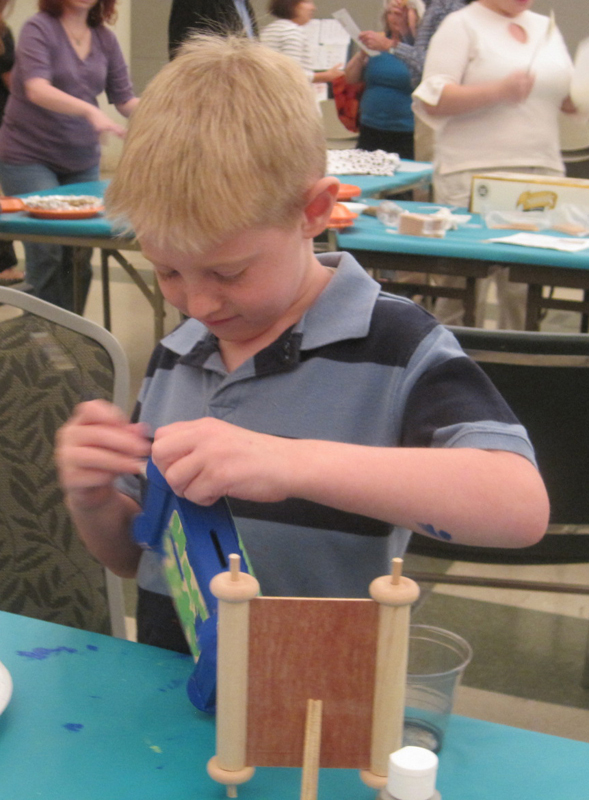 The June 7 Shavuot celebration included, a brief evening service, and then a choice of three programs: a discussion of the Ten Commandments with Rabbi Ralph Mecklenburger; Shavuot cooking in the kitchen; and A Ten Commandments art workshop with Gloria Sepp. June 25, 2011 marks five years since Gilad Shalit, an Israel Defense Force soldier, has been held in captivity by Hamas. The Jewish Community Relations Council of Greater Dallas and the Rabbinic Association of Greater Dallas have joined together to bring community awareness to the plight of Gilad Shalit. Displays are up in synagogues and at Levine, Akiba, and Yavneh Academy. Materials and handouts are available. For a list of these materials visit jcrcdallas.org and click on the “Bring Home Gilad Shalit” Action Alert on the bottom left. For more information about what you can do help bring him home to Israel, contact Laura Matisoff, JCRC program associate at lmatisoff@jfgd.org or 214-615-5292. For the fourth consecutive year, the Congregation Beth Torah Men’s Club has been honored by the Conservative movement with the Quality Club Award. Beth Torah is one of 50 Men’s Clubs in the nation to receive the honor, and the only one in Texas. The Quality Club Award is presented by the Federation of Jewish Men’s Clubs to synagogues that meet detailed criteria of programming, religious observance and leadership. Alan Hoffman, the newly elected Men’s Club president, will accept the award at the FJMC convention in July in Costa Mesa, Calif. The Beth Torah Men’s Club began its streak under the leadership of Rusty Dworkin, who served two years as president, and kept it going for Precker’s two years as well. ”We’re looking forward to another great year, whether there’s an award at the end of it or not,” Precker said. “Not that there’s any pressure on Alan or anything,” he joked. Serving the region’s largest population of Jewish university students, Texas Hillel has an eight-decade long history of involvement in the wider Jewish and general communities. Texas Hillel is governed by a statewide board of directors, and that board recently elected Howard C. Rubin of Dallas as the organization’s president effective July 1. Howard C. Rubin is an attorney with Kessler Collins. He is a graduate of Vanderbilt University and Southern Methodist University, and was chair of BBYO in Dallas in addition to his many years of service on the Texas Hillel board. He and his wife, Ann (a UT Austin graduate), are the parents of two grown daughters, both of whom are also UT Austin alumni. “Howard has been an active leader at Texas Hillel for almost a decade, and is intimately familiar with our engagement strategy. He is deeply committed to enriching student lives,” said Executive Director Rabbi David Komerofsky. Rubin succeeds David N. Goldstein of Austin, who has been president since 2008. Komerofsky noted, “David Goldstein’s experience as a board member and president of many organizations continues to be a benefit to Texas Hillel. His wisdom, kindness and generosity, combined with his keen business sense and passion for Jewish life, made him just the right board president at the exact time he was needed.” Goldstein was honored as the 2011 Maimonides Community Volunteer of the Year by Texas Hillel. Both Rubin and Goldstein participated in a leadership gathering with Hillel: The Foundation for Jewish Campus Life at UCLA in 2010. Rabbi Joel Zeff will join the Jewish Studies Initiative of North Texas on Sept. 2. His presence will help to significantly increase the number of classes taught and the impact JSI will have on the community. Many in Dallas have met and studied with Rabbi Zeff during the times that he has served as a scholar-in-residence, and know what a fantastic pedagogue he is. Rabbi Hanan Schlesinger is eager to have Rabbi Zeff in Dallas. “We are all looking forward to a great year of learning and teaching Torah,” he said. “Rabbi Zeff will be teaching in the adult education programs of a number of North Texas synagogues, as well as in the Florence Melton Adult Mini School program.” To arrange a program with Rabbi Zeff for your synagogue or communal organization, contact Rabbi Hanan Schlesinger, executive director of the Jewish Studies Initiative of North Texas, at 214-789-7241 or at ravhanan@sbcglobal.net. Chabad of Plano has established The Frisco Gan, a Mothers Day Out program serving the Northwest Plano and Frisco area. Children ages 18 months to 3 years will meet Mondays and Wednesdays from 9 a.m. to 1 p.m. The gan is located in The Stonebriar Academy, a beautiful facility with access to a covered playground, indoor playscape and a large classroom. Caring for the children will be two experienced and dedicated teachers: Tia Sukenik and Rivkie Block. For more information, e-mail thefriscogan@chabadplano.org. To celebrate his 60th birthday, Robert Epstein invited 140 friends to attend a special screening of “Tombstone” at the Texas Theatre to raise funds to acquire bulletproof vests for the 70 members of the Dallas Sheriffs Reserves. In lieu of gifts, Robert asked his friends to contribute to the Reserves. To date, Epstein has raised more than $10,000, but his immediate goal is $30,000. Bulletproof vests cost about $800 each and they wear out after several years. 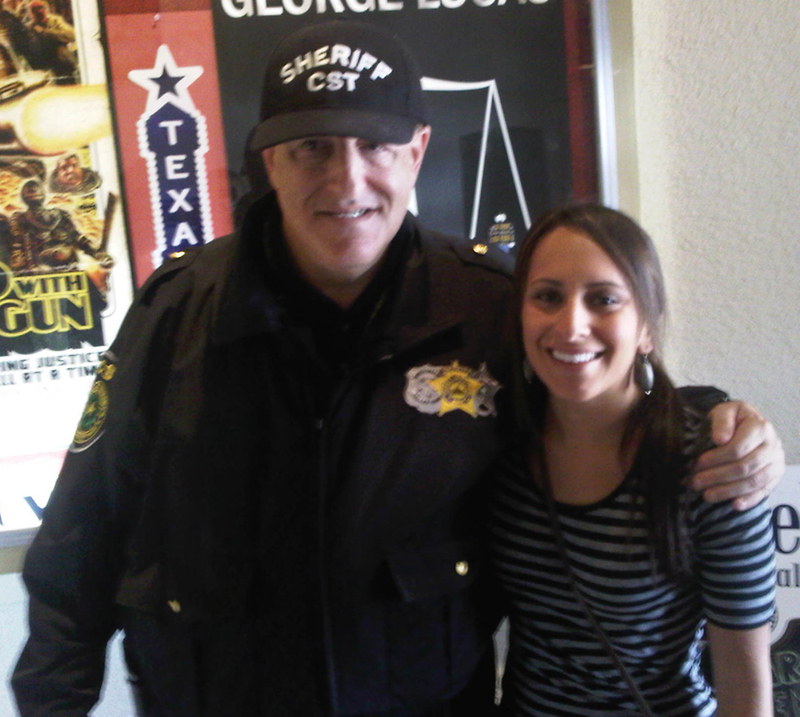 Bob is a member of the Dallas Sheriff Reserves. He works about 30 hours per month as a public information officer in the Lew Sterret Jail Lobby. He also works other assignments at the Dallas Golden Gloves and the Hella Shrine Circus. Bob was with the Texas State Guard, Military Police Brigade for three years. The Texas State Guard provided security for citizens during several hurricanes and other emergencies. Congratulations to Daniel Nathan, son of Karen and Bassim Nathan, upon his graduation from Miami Law School. Daniel received his B.A. from the University of Texas at Austin and his M.S. from Texas Tech University. He will be taking his board exams this summer. Best of luck Daniel, and mazel tov. Added congratulations to Adam Greenspan, son of Terri and Alan Greenspan who was recently named Drum Major at J.J. Pearce High School in Richardson. Mazel tov to Deanna Rozenblum, hair stylist/chemical technician/makeup artist who was selected among many to work on the hit ABC reality show, “Extreme Makeover Weight Loss Edition.” One of Deanna’s contestants was Staci Bridwell, married mother of two, who worked over the course of a year to try and regain her life back through weight loss. Staci meets her everyday challenges, dealing with work, kids, and a husband who suffered a stroke. Pushing past all obstacles she has managed to succeed in getting her life back. Her focus is to continue on her healthy path and help others who are struggling with weight loss. Watch Staci’s journey on “Extreme Makeover: Weight Loss Edition,” July 18 at 9 p.m. on ABC. Deanna provides all types of haircare and is available to work in the evenings as well as on Sundays. She can be reached at 818-424-9911. Deanna is married to Kenny Rozenblum and mother of two great boys Jordan and Levi who attend Akiba Academy.